This is essentially Psalm 18:32, word for word; because the Psalm of David as recorded in 2 Samuel 22 is almost entirely replicated in Psalm 18 as well. These are two significantly-lengthed chapters (51 and 50 verses each) that are almost an exact copy of each other – this is not something that’s unique in the Bible – 2 Kings 19 and Isaiah 37 are pretty much the same, there are some Psalms that are more or less a copy of each other; and there are many more passages or parts of stories in the Bible that are recorded more than once by various authors. I don’t think there will be much of a difference in the way that I study these verses, since they have the same context, just recorded in two different places. Or perhaps a more accurate way of putting it would be that Psalm 18 is 2 Samuel 22 – David’s Psalm – tidied up a little to suit the needs of the people for worshipping. 2 Samuel continues on from where 1 Samuel left off, and David is finally the King proper and we are given the details of his very prosperous days – but yet not without sin, misery and darkness. This psalm was a psalm of reflection for David, as he comes towards the end of his reign, and 2 Samuel 22, together with 2 Samuel 23, which was probably his last psalm, can be considered as an appraisal of God’s hand on his life as the King of Israel. In today’s study, we will examine David’s reflection on how God has empowered him through his reign as a King. It is God – make no mistake, have no doubts about this – it is God. It is God. The Bible may have central themes on love, the New Testament may be very much centered around the Son, but the entire Bible is really about God – how God did this and that, how God is this and that, how God can do this or that. It is not by David’s own strength that he achieved so much as a King just as it as not by Samuel’s whim or foresight that he was chosen as king. It was not out of luck, but of God’s blessings; it was not out of the weaknesses of his enemies that he was victorious, but out of the strength of the Lord Almighty. It was not the pagan gods and idols, or Baal or any other force or might or power that David worships, but it is God – the God of his fathers, the God of his people. 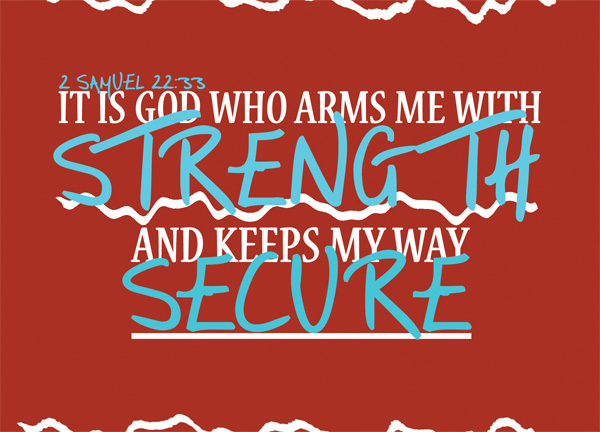 arms me with strength – A few verses down the road David elaborates – You armed me with strength for battle; you humbled my adversaries before me [2 Samuel 22:40]. David fought many battles, real physical and bloody wars. Right from the very beginning, soon after our introduction to him as the anointed one, we read about his battle against Goliath [1 Sam 17]. In fact, he fought so many battles that he wasn’t allowed to build the temple of God [1 Chron 22:8] – You have shed much blood and have fought many wars. You are not to build a house for my Name, because you have shed much blood on the earth in my sight. Yet even in the most physical of battles, the fight is not only about the body. Certainly, bodily strength is important, but the strength in mind and in fortitude is perhaps just as crucial. I don’t know about you, but I have no physical wars to fight (and I do not expect to ever be involved in one) – but as a Christian I imagine that I am standing at the frontline of a different spiritual battle everyday. Well, it’s the same war, the spiritual war, but it feels like a different battle everyday. We too need to be armed with strength by God – strength for this spiritual battles, physical strength, mental strength, spiritual strength. Even if we are weak and lacking, God is still able to empower us – those who stumbled are armed with strength [1 Samuel 2:4]. keeps my way secure – Secure is perhaps a more guarded and more modern way of saying this, but other renditions have this termed as ‘perfect’ or ‘blameless’. I would prefer the NIV version, because as good as I know my way is and as perfect as I know is the path that God has set before my feet, it sounds a bit too presumptuous for me. That’s just me though. I take great comfort in knowing that my ways are secure – because, simply, it is God. God is with me. It is not that we will be perfect and blameless, look at David’s life as an example – as good as he was, he did sin, and for that he suffered dire consequences as well. But no, we’re talking about the road of Christianity. It will be hard, there will be temptations and afflictions. Remember how it took David such a long path to the throne, as compared to when Saul became King? From the time when David was anointed, to the time he finally became King, it was a treacherous road – but God was with him, God removed his obstacles, and God kept the way secure. If God is for us, who can be against us? [Rom 8:31] If we recognise that God is with us, and we acknowledge him as our higher authority, we will naturally be able to stay on the righteous path, no matter how hard it is. When things are going well for you, when your path seems smooth and clear and without obstacles, and you seem strong and are going strong; do not forget that it is God who has blessed you, who has strengthened, and it is God who has kept you from the wrong path. Not you, not your own strength, not your credentials or your own skills or effort, and most definitely not luck or by chance, but God’s blessings. It made it!!! I’m relieved! ^^ heee heeee your letter actually came quite a few days ago? I was intending to make a quick and immediate reply, but well as usual I couldn’t quite write through to the end of it in one go without falling first to exhaustion. I won’t repeat what I wrote in that, you should get it soon (I should send it soon), just know that I have been truly excited about your letter! Take care, and I’m praying for you! Your conclusion I found interesting. It has been so many years since my path was smooth, clear, and without obstacles I would probably not recognize such a thing. Thanks for the post and the reminder that a rough road is probably better than a smooth one.